This figure eight exercise helps teach some of the best techniques on how to dribble a soccer ball. 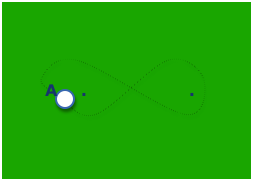 It is simple yet very effective..
- This figure eight dribbling just needs 1 player, 2 cones and 1 ball. - Set up cones 4-5 yards apart. - Dribble throughout the 2 cones. - Proceed in 60 second intervals. - Utilize best dribbling skills: great balance, bent knees, body slightly leaning over the ball, touching ball with foot on every step. - Use inside, outside, and laces of your foot to dribble. - Make short, sharp steps keeping the ball very close. - After making a turn around a cone, there should be a short, quick acceleration while maintaining the ball very close at all times. - Use only the outside of your feet. - Use only the inside of your feet. - Use only left foot. - Use only right foot. - 5+ minutes for this soccer figure 8 dribbling drill.